Previously we showed you how you can use Learning Pathways to help aid your learner's development. Now you're ready to move on and start getting creative with MyChoicePad by creating your very own grids. This is where MyChoicePad really comes to life! Although we've included a few Grids to get you started, these Grids are really just examples. 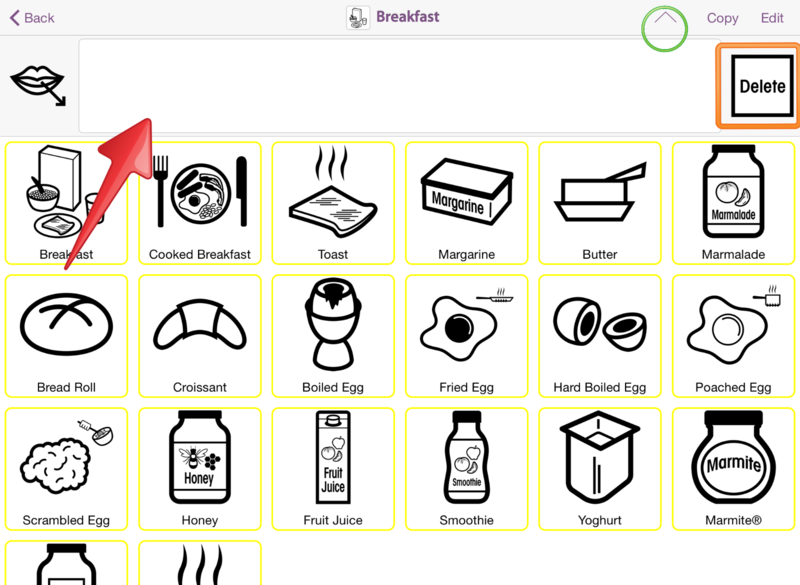 To get the most out of MyChoicePad you can to create Grids to suit your individual need. Before we look into how you create your own Grids, we wanted to share some example Grids with you to demonstrate the range of possibilities. The aim of this grid is to encourage conversation whilst carrying out an activity. It's often helpful to "walk and talk" someone through an activity, in this case we're creating a Cheese and Jam sandwich (yum!) but the activity could be anything! You're really trying to encourage conversation with the person you're working with, "What do we need to start making our sandwich? How about some Bread? Ok, Let's take out some Bread". 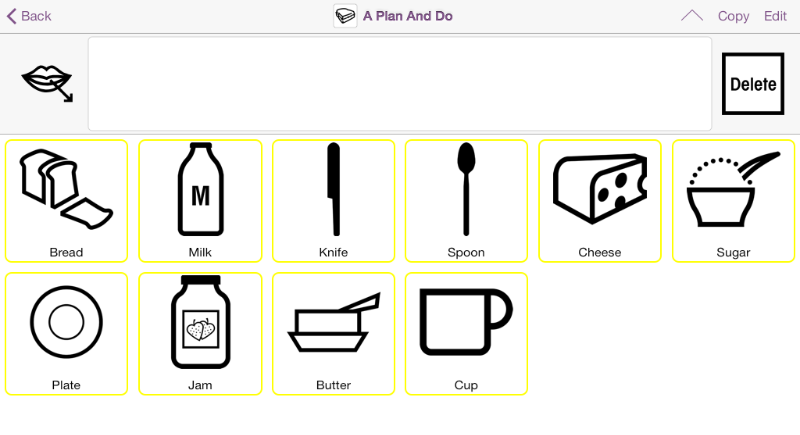 Using the Makaton symbols and signs in MyChoicePad, you can reinforce the words you are using to help layer your conversation and encourage understanding. Facilitating a conversation like this can help to develop skills and knowledge in a practical, engaging way. This Grid was created by a fantastic Speech and Language Therapist for use with her Early Years children to help talk about emotions. 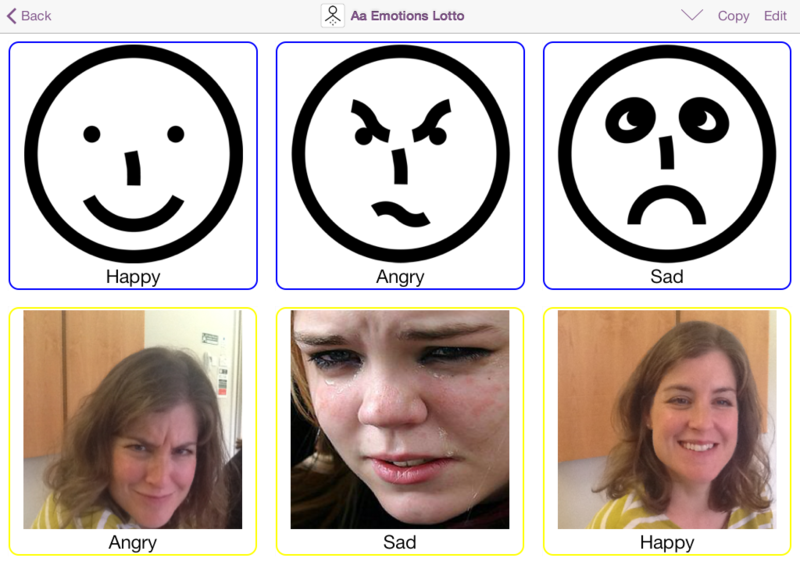 It facilitates a simple activity in which the child matches up the emotion with the correct photo. Again, we're looking to facilitate conversation and reinforce word and concepts with the Makaton symbols and signs. Here's a really fun example of MyChoicePad being used to reinforce spoken word and help understanding. 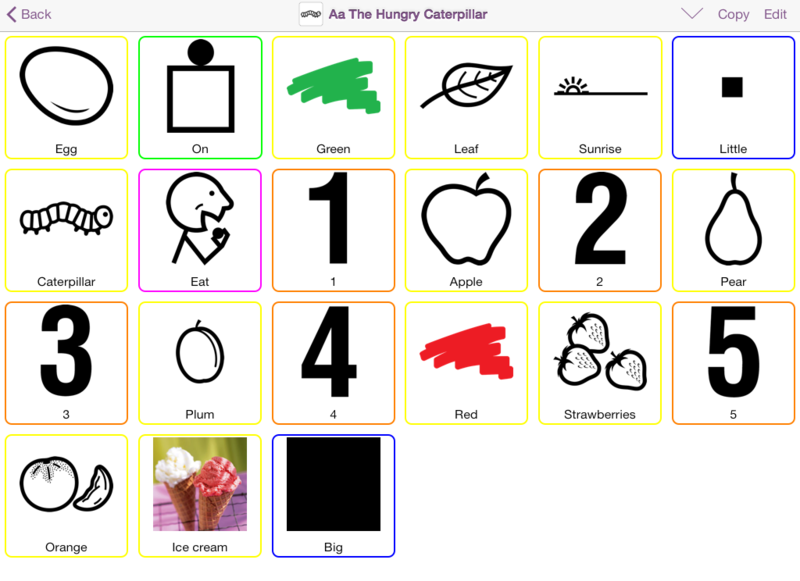 This Grid was made to help communicate The Hungry Caterpillar, a fantastic children's story that most people are familiar with. Some of our MyChoicePad trainers are very fond of using Grids such as this to make children's stories more accessible and enjoyable to all! Hopefully that gives you some ideas of Grids that would be helpful for you. Grids are quick and easy to make, once you've made your first one, you'll be making them in no time. Just follow these 3 steps and start getting creative! This will help you to find it later. To name your Grid on the text at the top of the screen that says "Tap this text to name grid...". To add a Grid image, tap on the white square to the left of this text. To start choosing the concepts you would like in your grid, click on the "add" icon. This will bring up the Concept Library where you can select the Concepts that you would like to add.